Peeling garlic is fun. Not only do you get to take out any pent-up aggression on the poor, unassuming garlic cloves, you can pretend you’re on a cooking show. 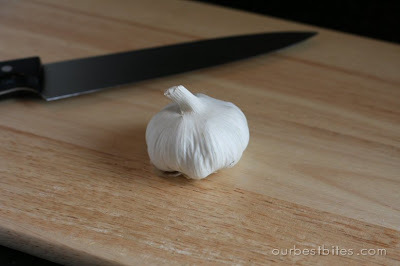 This is how to peel garlic; lay it on its most stable side on a flat surface. Place the broad side of a knife on top of the garlic clove. With your non-dominant hand, hold the handle of the knife steady and place the palm of your dominant hand flat on the part of the knife that has the garlic underneath it. 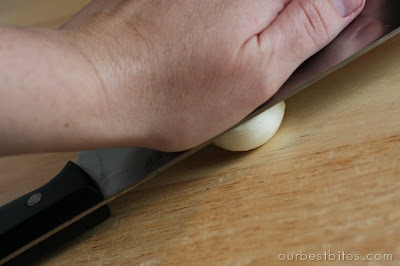 In one quick, firm movement, press hard on the knife blade with the heel of your hand. This crushes the garlic, making it easier to chop or press, and it lets you pull the papery skin right off! Or, you could always grab one of these! ooo-i’m going to have to try this one. great tip! I was taught in a neighborhood cooking class recently (haven’t had a chance to try it yet though) that if you dribble a little water over the peeled garlic, it will not stick to your fingers or your knife as you chop/mince/slice it! OMG, this is an amazing trick!!! 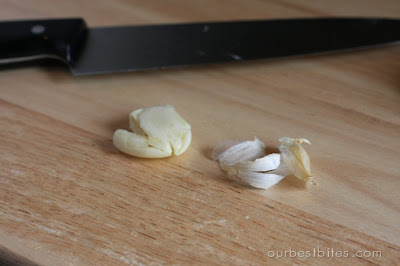 I’ve spent soooo long peeling the papery skin off of garlic with a tiny little paring knife, one little sliver at a time! Thank you!!!! Hi, great site! Just wanted to let you know that a website called omgnom.com is using this post, without any credit to you. I found out about them because they have used dozens of our posts without our permission, and have been removing watermarks from our photos. Have a good day!